"Starting with six different hop varietals added to the brew kettle & culminating with a massive dry-hop addition of Simcoe hops, Bell's Hopslam Ale possesses the most complex hopping schedule in the Bell's repertoire. Selected specifically because of their aromatic qualities, these Pacific Northwest varieties contribute a pungent blend of grapefruit, stone fruit, and floral notes. A generous malt bill and a solid dollop of honey provide just enough body to keep the balance in check, resulting in a remarkably drinkable rendition of the Double India Pale Ale style." A gorgeous fiery golden orange. Generous fluffy peaks of white head crown it regally. This is exactly how an Imperial India Pale Ale should look. 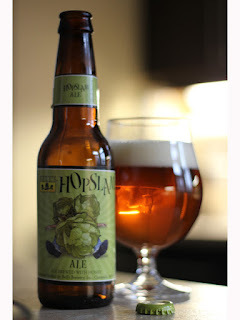 There is no mistaking Hopslam as soon as the bottle cap is removed. The waft of delicious tropical fruit scents smacks you in the face. Grapefruit, mango, pineapple. Rich, lust and spectacular! In a word, incredible! The malt sweetness balances the bitterness one would expect from the huge grapefruit note. Continued complexity is found in the punch of other tropical fruits. At 10% ABV one would expect this to knock you off your feet, but while there is some alcohol burn, it is not as forward as the ABV would have you expect. Well this is indeed the famous "Hopslam", and for reason. It is just a remarkable beer that is complex yet balanced. Sweet with just the right amount of bitter. It is released every year in the winter, making you long for warm Spring and Summer days. Drinking this as soon as you can is best. Aging would only make it loose the hop profile it is famous for. When this is fresh, it is heavenly. After a few months, this is still a delicious nectar, but it does start to loose some of the punch. A definite "A+". Looking forward to next year!